Tunisian protestors shout slogans during a visit by their prime minister in the town of Tataouine on April 27. Tunisian police fired tear gas to break up rioting by hundreds of protesters who took to the streets after a fruit seller set himself on fire when police stopped him working, local residents said. While the incident appeared to be quickly contained, the self-immolation recalled a similar desperate act by a vendor that unleashed Tunisia's 2010-2011 revolution and subsequent uprisings around the Arab world. Mohamed Bouazizi, a street vendor, set himself alight in a public outcry that unleashed a wave of protests that led to the ousting of President Zine El Abidine Ben Ali. A crowd of young men in Tebourba, about 35 km (22 miles) from Tunis, then threw rocks at police. "Hundreds of angry youths have clashed with police who have been firing tear gas," said Anis Mabrouki, a local resident. The vendor was being treated for his injuries in hospital. President Beji Caid Essebsi took the unusual step of deploying the army, announcing in Tunis that "the state must protect the people's resources" after protests in impoverished inland provinces in recent weeks. Sit-ins and other demonstrations have blocked roads and notably led to a halt in production at oil and phosphate facilities. Essebsi said the "grave but necessary decision" was made at a top-level government security meeting. He insisted on the people's freedom to demonstrate, but said protests must be "within the framework of the law." After militant attacks and political violence in recent years, Tunisia is in a prolonged state of emergency that allows authorities to take exceptional measures such as sending in the army to assure security. "The democratic process in Tunisia is seriously threatened," the president said. He argued that the Tunisian economy has lost 5 billion dinars ($2 billion) because of phosphate mine stoppages, worsening government debt. The protesters are desperate for job opportunities and better living conditions in inland regions blighted by poverty in comparison with richer coastal cities. They are also skeptical of a government economic reconciliation plan that would allow magnates accused of corruption under the overthrown regime of President Zine El Abidine Ben Ali to resume business activities, in exchange for reimbursing the state for ill-gotten gains. Protesters say it's an effort to whitewash corruption, while the government says it's a way to boost the atrophying economy, which has yet to recover from the 2011 Arab Spring revolution that brought Tunisia democracy. The economy was further damaged by militant attacks targeting tourists in 2015. The president, a former ally of Ben Ali, also lashed out at political parties and other groups that are encouraging civil disobedience. 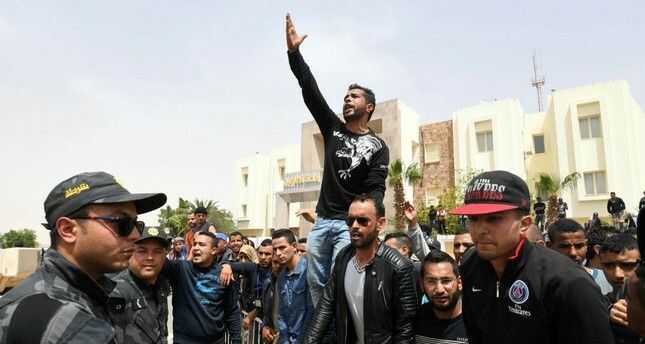 The economic malaise and frustration that helped fuel the 2011 uprising against Ben Ali still simmers in Tunisia especially in marginalized central and southern regions where unemployed youths say they have few opportunities.